We've all seen games lauded because "you will never play the same game twice!" 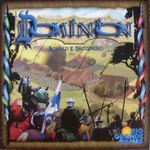 Games like Dominion or Carcassonne where odds are you will never see the same configuration in two unique games. I find that lots of these may not be the same game to game, but despite the different layout or how the game went they still felt the same. Regardless of the order in which cards or tiles etc were played the decisions weren't really unique. Which games make you feel like this? Ra feels like this for me. Despite the fact that the tiles will never come out in the same order for two games, and that even if they do the bids probably will be all mixed around, each game feels really similar to the last. I still like Ra, and will play if people want too, but I don't get the sense of infinite replayability like some may. Dominion has the same issue but to a lesser degree than Ra. A game where you have cards A through J and a game with cards A through I and M instead of J will most of the time feel like the same game and the strong combos won't change.